Posted on December 30, 2013 by F.H. So, how did 2013 turn out? There are plenty of things to be thankful for. It hasn’t been the most uplifting year for me, and at times I really struggled. I decided to take part in the #nurture1314 project to reflect upon the positives. Check our my 13 big highlights and my 14 wishes for the New Year. Being selected as an e-learning leader at my school – being able to strengthen my passion in IT. Individual student blogs – a way to watch my blogging journey grow. Genius Hour – I think the person who learnt the most from Genius Hour was me, not my students. Having a new year level – Year 4. More independence,more motivation! Ipads in the Prep-6 classes – and the enthusiasm of colleagues to utilise them! Gaining experience from others on Twitter – a whole new world I wasn’t part of until May. Happily using my iPad to read books, using the Kindle App – so many books to choose. Learning how to record my data in a time-effective, meaningful manner. So much easier! Independent assessment – students’ assessing their own and others work – timesaver! Growing as a stronger and more resilient person as a result of many challenges during the year. Holidays – 3 weeks in Europe was the perfect battery recharger, ready for Term 4. The 100 Word Challenge – a fantastic writing challenge for students, and mine loved it! Skype in the classroom – opening up those communication lines to become more connected. So where will 2014 take me, or where will I take it? 1. I wish to create a more flexible learning environment – reduce desks, encourage students to find their own space and to find the classroom supportive. I’ve started this already by removing my teacher desk. I’m hoping to encourage students to own their learning, but to use me as a resource. The Twitter hashtag #space2learn is helping me with this. 2. I wish to provide more authentic learning opportunities – by using Genius Hour, SOLE, Coding and Project Based Learning. I knew about none of these terms at the start of 2013, so imagine how much I’ll know in 12 months time! 3. I wish to be more of a presence in the classroom – I wish to inspire students to lead – hopefully by helping to run the Primary SRC in 2014. I did this in 2013, but had a few challenges. I’ve come up with some great new ideas and projects that I hope to launch with the support of the students and my colleagues. 4. I wish to share my experiences about disabilities with my students. In 2011, my 23 year old autistic brother visited my classroom, and my students talked about it for weeks. The learning wasn’t maths or literacy, but a real life lesson. 5. I wish to maintain by classroom blog and increase the global connections that it currently has. It is truly one of the most authentic learning opportunities I have already provided and hope to continue. The feedback I can give students, and that other readers can give them via the blog is so powerful. 6. I wish to support parents with better communication through our classroom blog. Using the blog as a communication tool as well as a sharing tool will prompt parents to access it, but I need to find that line between keeping them informed and bombarding them with information. If all of the information is on the blog, will they bother to access it? 7. I wish to ride my bike to work at least one day a week. Small goal, I know, but the introduction of iPads at my school has reduced the amount of work I am taking home each night and subsequently,each morning. Easier to ride my bike with a smaller backpack! As Bike Education is part of Year 4, if I am being a positive role model, I think it will resonate with the students more. 8. I wish to commit to a sport or exercise on a regular basis, in addition to #7! I’m thinking of yoga, Pilates or badminton. I could always fall back into netball maybe, but would like to try something new! 9. I wish to read more. For business and for pleasure. Small goal, but I think one book per term and one book per holidays is achievable. I find that my workload sometimes interferes with my reading time, but 2014 might be different. 10. I wish to be a supportive mentor. I have been assigned a graduate teacher to mentor during 2014. I’m excited to be responsible for helping someone, as I was recently in the same position myself. Hopefully some of what I do will be of use to him! 12. I wish to learn about Whole Brain Teaching. My new class has a few students with ADHD, learning difficulties and Aspergers, and I feel that this method of teaching may help me streamline the directions I am giving and may help them better understand tasks. 13. I wish to say no. Often I am asked to organise events, make phone calls, be available for meetings X, Y and Z, which is beyond my teaching load and hours. I’m not opposed to helping others outside of work hours, but as I learned this year, stress and anxiety are serious medical conditions – reducing my workload is one way of combatting this! 14. I wish for regular visits to friends. One of the biggest challenges of living in Mildura is the isolation from friends and family. I’ve never been one to be homesick, however ‘friendsick’ is more common. Visits just mean being organised and financially secure for petrol and airfares. Here’s to changing that in 2014! Posted on December 16, 2013 by F.H. A) She’s got too much time on her hands. B) Obviously she doesn’t have a family. C) I don’t have time. It’s a common excuse that teachers hear from students regarding their homework. 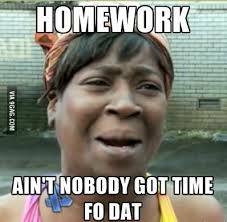 I don’t know about other teachers, but the homework I set is to consolidate student learning. It covers things we have already looked at in class. It’s not compulsory, but often gives me feedback on what I haven’t covered properly in class. By setting the homework, I am hoping that students will be confident in completing it, to prove to me that they have improved upon the set topic. This morning I read this article, tweeted by @johnqgoh: “More teachers sacked for bad behaviour than poor skills”, courtesy of The Telegraph. It refers to ‘fixing’ teacher’s classroom skills, informal training, formal training and teachers having a mere ‘basic’ knowledge of the curriculum. I feel disappointed that teachers don’t feel that they need to improve. Any employee, whether they are a garbage collector, funeral director, teacher, accountant or scientist..can improve. I have heard staff say, “I don’t have time for that”, referring to the invitation to sign up to a blog, join Twitter, create an e-book, or navigate Pinterest. Learning about technology can be daunting, but it’s a necessity in today’s classroom. Tomorrow, I am introducing the idea of iPad Bingo to my staff. It’s a bit like their own homework task for the holidays – to consolidate and improve their iPad competency with the new iPads they have had since the beginning of Term 4. Some teachers are more confident than others, hence the 2 different levels. 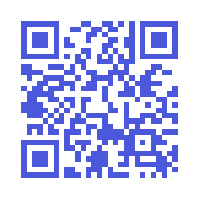 Scan the 2 QR codes below to check out the iPad Bingo. As a third year teacher I know that I am only at the beginning of my teaching career. I know I don’t have my own children, or any pets, but that doesn’t mean that I work 24/7 on lesson plans and classroom strategies. I look for any opportunity to try something new, to innovate and to extend not only myself, but my students. If teachers aren’t prepared to push themselves to improve, how can they expect their students to? Should you blog in the classroom? Posted on December 14, 2013 by F.H. At the beginning of 2012, I wanted to do something different with my students. I wanted to share our successes with their parents, as many parents didn’t make it into the classroom. I started a classroom blog. Inspired by Kathleen Morris, I embarked on a blogging journey – all self-taught. I signed up at Edublogs and used their User Guide to find out the nitty-gritty of what buttons to press and what their purpose was. I watched videos like this one, and looked at other blogs and info graphics like this. Setting up my classroom blog looked a little bit like this photo I saw on Twitter earlier, posted by @dendari. My school allowed me to use Edublogs as my blogging platform, as it is the ‘world’s most popular education blogging service’ (http://edublogs.org). Safety and privacy was my number one priority, so I began to set up a leaflet to hand out to parents, including a permission slip and frequently asked questions, adapted from the one that Kathleen Morris had developed. Click on the following link to see my Blog information for parents. Is Year 2 too young for a classroom blog? Is it necessary to have photos on the blog? Would commenting be too tricky for 7 & 8 year olds? Would anybody visit our blog? Was it going to be too time-consuming for an already time-poor teacher? How would I encourage parents to A) look at it and B) leave a comment? At first, it was exciting and nerve-racking as I tried to figure out what the purpose was of having a classroom blog. Sure, I wanted people to see the amazing work my students were producing, but then what? We learnt about reading posts – posts that I had written about our lessons – which inspired my students to show their parents when they got home from school. As each post ended with a question, we talked about the importance of a conversation. A good conversation always involves questions, so people have something to respond to. So too, does a good blog post. Commenting was the next challenge, as it was important for the students to reflect on activities in class. We talked about how a comment was a little bit like a letter – it began with a greeting, was always related to the post and ended with a salutation. Sometimes, a comment might even have a question in it, to encourage conversation! Both of the Year 2 classes held a Blog Launch towards the beginning of our adventure. It was a great chance for the students to teach their parents about what they had learnt about blogging so far – how to navigate the blog, where they could find comments that people had left and how to write their own comments. Since my first classroom blog last year with Year 2’s, I have learnt many new elements of blogging. My Year 4’s have taken blogging to a whole new level and we had had the opportunity to be involved in Quadblogging, links with other schools, Skype chats and the idea of using individual student blogs as a type of digital portfolio. Advances in student confidence with the use of technology, but also typing skills and the willingness to teach others. I’d love to hear your success stories about blogging in the classroom, or any questions or queries you have about beginning your own. It’s a very worthwhile journey!